As I have said time and again, there is no such thing as having too many resources available to draw from when you are the GM/DM of an RPG group. Be it location guides or monster books or adventure modules, they can all help you run your game the way you'd like, but may not have the time to create from whole cloth. And since every gaming book I see as *pirate voice* more like guidelines */pirate voice*, no matter what they were originally created for, you can alter them to your needs. 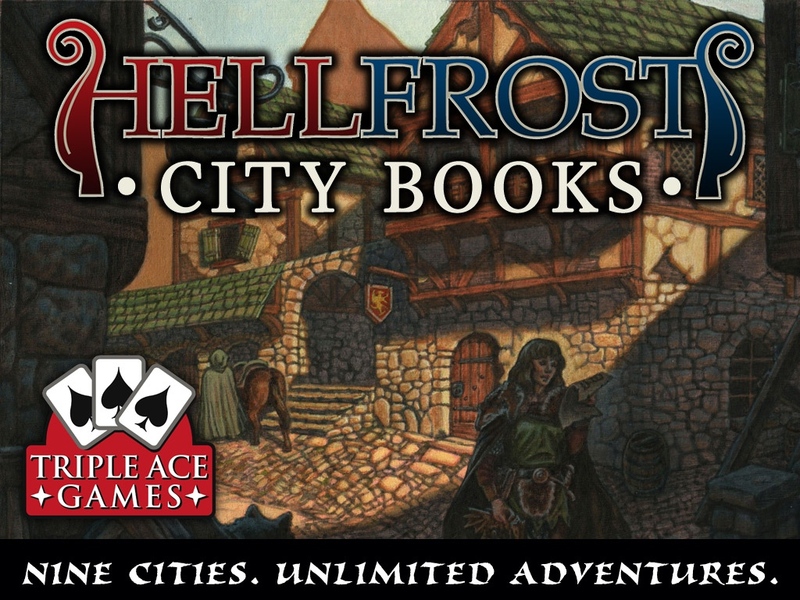 As such, I give you the Hellfrost City Guides by Triple Ace Games, up now on Kickstarter. This project looks to fund the printing of five books. They will be: Cities of the Freelands, Cities of Magic, Cities of the Crystalflow, Cities of Royalty, and Cities of Crime. Each book has the same general layout, covering various city's histories, social hierarchy, government structures, prevalent religions, the military strength of the city, and various other crucial bits of information if you plan on adventuring in that area. There are also full-color maps of each city, along with locations of interest pointed out. And it looks like the books will be made, as the campaign is well over their funding goal with still 12 days left on the clock.